Hello, hello: S&F is back from its hiatus. A lot has happened in the interim between this and my last post. I had gotten -- and left, when my training bond expired -- a job in legal publishing. I decided to follow my passion stomach and applied for a job at one of my favorite food magazines. I got the job plus ten more pounds (it comes with the territory). I decided to expand the blog to include short dining reviews, so here's a disclaimer: Every meal I write about is paid for by my own money (or my family's, or my boyfriend's, but you get the point), unless otherwise stated. These are my own opinions and do not reflect the opinion of the magazine I work for, nor any other establishment or entity. I fact-check everything but if you find any discrepancies, please feel free to e-mail me or comment. 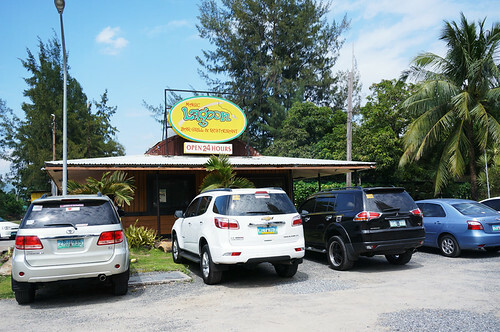 Magic Lagoon is an unassuming bar & grill in Subic. The entrance looks plain enough to make you question the bevy of cars parked outside, but the inquisitive diner is rewarded with lush greenery upon entering. There are man-made falls, a creek, trees everywhere, and even a freshwater lake. 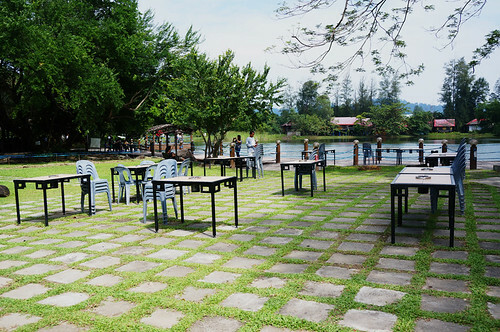 You can even do cartwheels on the al fresco area without disturbing other tables (I'm not saying you should or that it's appropriate behavior, but you could) -- it's that spacious. The farm to table concept is one of 2013's biggest food trends, but Magic Lagoon takes it a step further: here, it's literally line to plate. 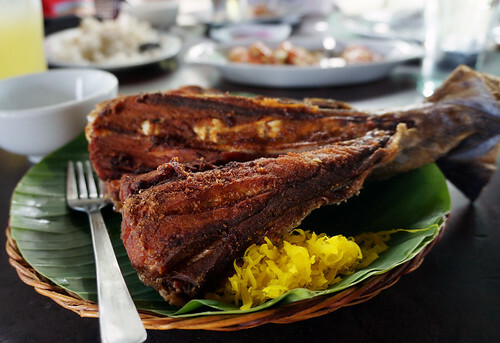 You can opt to rent a fishing rod and the restaurant will cook your catch for you for a small fee. This man was a beast on the waterfront, catching buckets after buckets of fish. 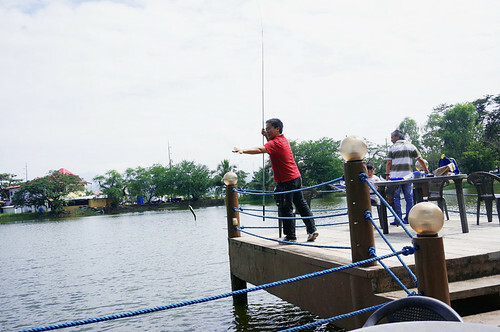 Since it was a bit hot for fishing, I ordered from the a la carte menu instead. This was my mistake. I had grilled liempo, garlic shrimp, crispy buntot ng tuna, and sinigang na kambing. The standout was the kambing. I expected the meat to be tough and gamy, but it was tender. Your teeth don't tear so much as sink into the meat. The soup had just the right degree of sourness; drizzled over garlic rice, it is perfection. 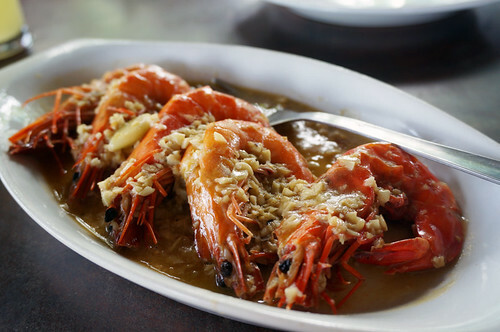 The other dishes were good, but they tasted very much like the food you can get at the numerous dampas in Manila. Don't get me wrong -- the food here has its charms. It's good, homey, and unpretentious. But if I wanted dampa food, I would have gone there. And so I found myself regretting my order and envying the next table. They were digging into their freshly caught, freshly grilled fish with relish. Judging by the speed with which they cleared their plates, whatever they had must have been very, very good. 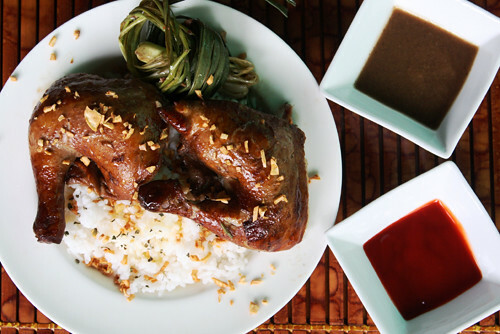 Magic Lagoon may not be a place where every dish is a winner, but it is a place that rewards effort. Don't make my mistake. 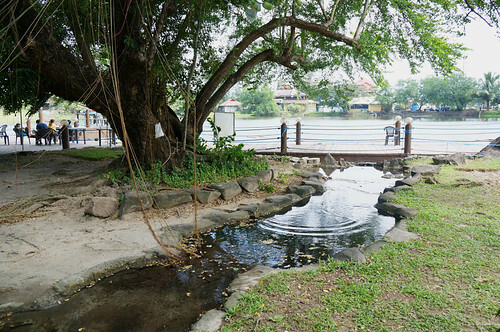 When you dine here, be patient and fish: you just might find yourself falling for Magic Lagoon hook, line, and sinker. 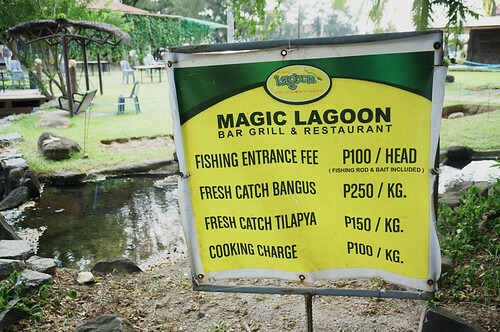 Magic Lagoon is located at Building 716 Bincentennial Park, Rizal Highway, Subic Bay Freeport Zone, Zambales. Unless you've been living under a rock, you've probably been keeping tabs on the Royal Family. You've probably heard about Prince Harry's Nazi Halloween costume and his redemption via his military career (because men in uniform are totally dreamy... unless it's a gestapo uniform). Or, more recently, Prince William's fairy tale wedding to mayhap the most gorgeous woman on earth, Kate Middleton. This year, the Royal Family has got more reasons to celebrate as 2012 is also Queen Elizabeth's diamond jubilee. I was asked by Appliances Online to create a recipe I would serve to the queen. I wanted to do tea party fare, as I've always -- quite unimaginatively -- associated England with tea parties. Marie Antoinette with her infamous "let them eat cake" line (which she never actually said, by the way) is also something that pops into my mind when it comes to royalty. It's only logical that pound cake should follow since the pound is also England's currency! Or at least, logical to a person with a thought process as convoluted as mine. 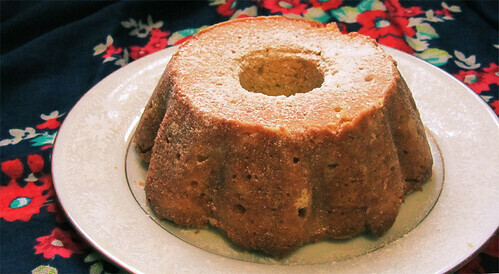 Pound cake recipes are generally simple. The oldest recipes require a pound each of four ingredients: flour, sugar, eggs and butter. These days, bakers tailor proportions to personal taste. Excuse the messy plating, dirty utensils and the awkward fuzzy blanket. I am exactly the type of slob who eats in bed while watching cartoons. This week, I'm road testing recipes for my boyfriend who's moving into a new dorm. He wants to cook his own meals but he's still deciding between getting an electric grill, a convection toaster oven or an electric stove. This meal was cooked in my family's prehistoric George Foreman grill. I won't lie; this isn't the best chicken I've ever made but I love how the meal came together in a snap. The whole thing took under 10 minutes to make! And did I mention that Foreman grills are idiot proof? Even a Neanderthal -- or a boy who's never cooked in his life, which is kind of the same thing -- can use one. This is surprisingly flavorful for a 10 minute meal. Sure, the chicken isn't succulent (as almost anything cooked in a Foreman grill is wont to be) but what it lacks in texture, it makes up for in flavor. 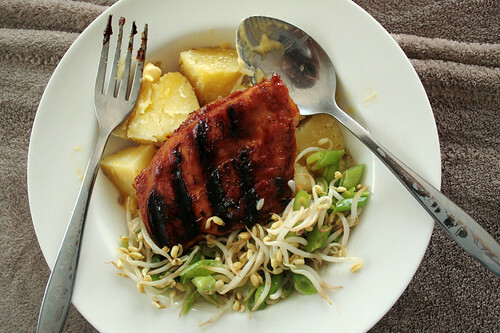 The meat is a little sweet and tangy from the hoisin sauce while the Worcestershire sauce lends a subtle smoky flavor that wouldn't be out of place in a charcoal grill. It only takes 7 mins tops to grill the whole thing, but can you see those lovely grill marks? Next time, I'm going to try brining the chicken before marinating it to help tenderize the meat. I'm so sorry I neglected this site. Very sorry! I was busy studying... scholarly things like how many stones the goddess Nuwa used to repair the Celestial Road in Dream of the Red Chamber (36, 500, but she had 36, 501) and how many times it's possible to die and get reincarnated in Native American literature (fairly often, apparently). Or even how the word nostalgia means "the ache of an old wound" and I guess that means how I wish I had done plenty of things differently over the last four years, and how sometimes the choices I didn't make come back and itch like phantom limbs. Huh. 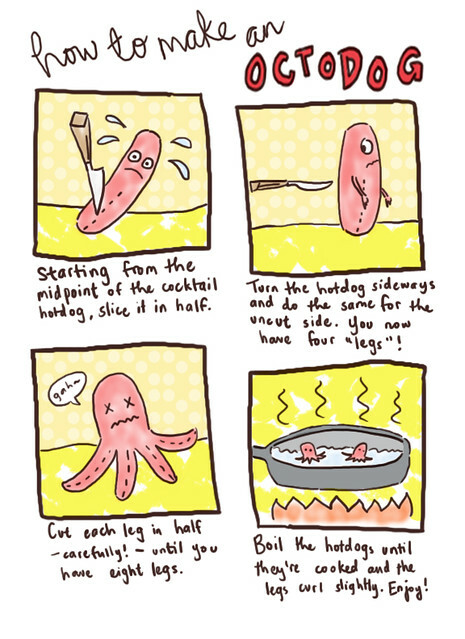 Now that I've graduated, I'm officially overeducated and unemployed so I have plenty of time to think about sillier things like how to turn hotdogs into octopodes. Yes, octopodes, not "octopi". Thank you, college, for teaching me that. Watch out for a series of illustrated how-to's inspired by Robert Loeb's Wolf in Chef's Clothing! 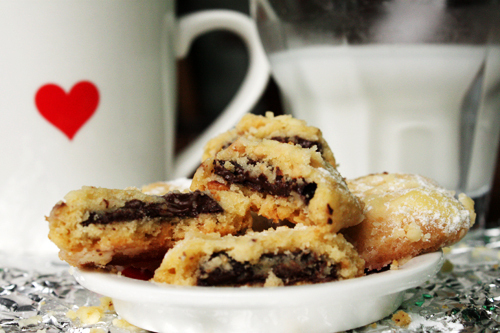 This recipe is based on Yummy magazine's Surprise Chocolate Kiss Cookies. The original was amazing. Think: the crumbly, nutty goodness of a tea cookie with a warm and gooey chocolate center that rolls and dances around your tongue and yes, tastes and feels just like a kiss. My heart swells and my teeth ache just thinking about it. I followed the original recipe (you can find it here) but, for my second try, I substituted cashew nuts for walnuts and baking margarine for butter. It tastes almost if not just as good and slashed about a hundred pesos off the production cost. The difference is in the texture; these cookies offer more of a bite compared to the almost airy texture of the original recipe. That, or maybe I didn't chop up the nuts as finely as I should have. :-S Although the cookies may be eaten as is, I recommend nuking them for a few seconds to melt the chocolate. This is the first in my lineup of baked goods (French macarons! Rootbeer mini bundt cakes! Heart shaped scones!) to sell for a business I'm planning to start during the second quarter of 2012. Right now, I'm still working out the kinks like sourcing the packaging, doing test runs to ensure consistency and figuring out the boring nitty gritties of running a business. And of course, the hardest part: trying to muster the discipline not to gobble up everything I bake the minute it comes out of the oven!